I was finding myself too cold this winter and decided the sofa had to come away from the wall which is by two windows. This layout has worked quite well and I will likely go back to it when winter has passed. Several years ago I discovered these room planners that different furniture manufacturers and even places like Pottery Barn offer on their web site. 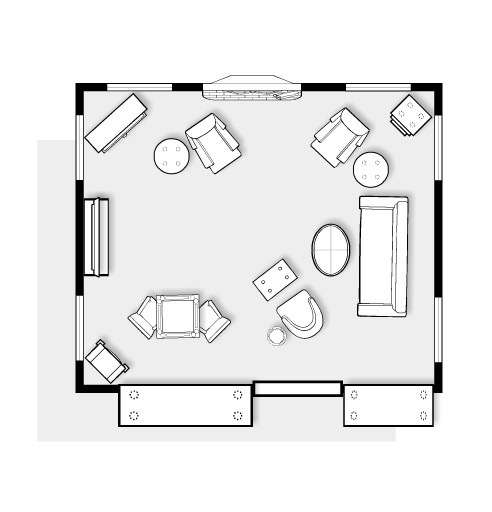 So I took accurate measurements of the room size and place certain things like windows and the fireplace to help me lay things out. The two odd looking pieces on the lower part of the picture are representing the two wood tops that are part of the built in cabinets that you can only see from inside the living room and the straight white piece is supposed to represent the step down into the room. I only include them because they have opening doors and drawers so furniture can't be up next to them. I reorganized it a bit to pull the sofa away from the wall but in doing so I had to shuffle a few pieces around. The room is large but the two wing back chairs are recliners and have to have a certain footprint given to them. This saves me from moving the real furniture around and a little less backache. I also measured each piece of furniture for width and length so they are as accurate as possible. I save each plan so I can come back to it and do any re-arranging that I want. I just save it as a new plan with a new date and it works great. I moved the green striped chest to the corner on an angle so there would be room for the one recliner. I got out y furniture pads and started the move. It wasn't terribly hard but my coffee and end tables are super heavy and cause me the most labor. A couple of adjustments of the chair, sofa and recliner were made to fit in the best way and then I was done. Dan doesn't much care about watching tv (he reads and surfs the web on his iPad) so he gets the recliner on the left since the tv is not easy to view from there. All the rest of the furniture is comfortably set to be able to view it. I go between the white swivel rocker and the sofa. I avoid the recliner because I always fall asleep! A panoramic of the room. I can walk behind the sofa to access the windows when needed. One end table ended up by the window on the left side which is now holding my big Christmas Cactus. Dan enjoyed his new spot last night and I found the new setup to work great for me too! It was a sun filled warm day and the early evening sky was beautiful. Snow has been melting like crazy and we're all happy about it up here! Reality is coming back though so next week it's back to the real grind of winter! I am a very visual person so I need to see how things will look before I know it is what I want. These room design planners are the best. We are having sunny and mild temps too. Love it. Aren’t they the best! Sure saves time and the back! I normally don’t put my furniture against the wall but with the current furniture getting everything situated just right has been challenging. We’ll see how long this works out! I bet you will like this new lay out. I like the two recliners on the same side of the room and the chair and ottoman opposite. We’ve enjoyed some warmer temperatures the last few days but cold and snow are on the way next week, too. Stay warm! Pretty room. 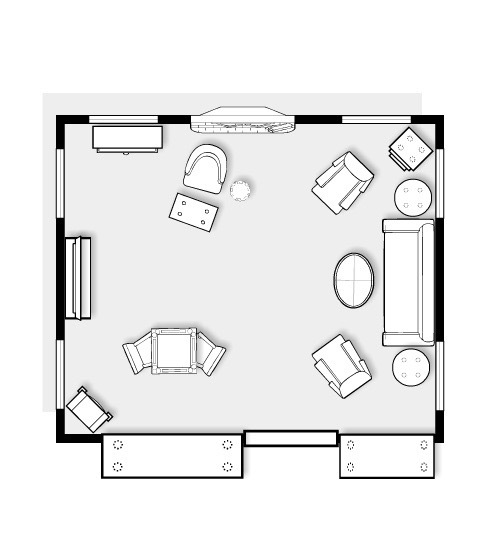 I have never used one of those room design programs but it sure looks like fun. Great job. Glad you're getting some sun Liz! The new arrangement looks great. I love moving furniture for a bit of a change. It's hard in this home with the furniture I have, so I mostly move chairs from room to room. :) Thanks for sharing with SYC.